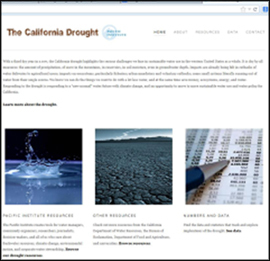 February 25, 2014, Oakland, Calif.: The Pacific Institute has launched the website www.californiadrought.org. This compiling of tools, research, and information on the California drought serves as an invaluable resource to facilitate the work at every level to address current issues and plan strategies in the face of a drier future for California and the western United States. Resources on the website include tools and reports from the Pacific Institute and links to resources and data from more than a dozen state and national organizations, with ongoing updates. Responding to the drought is responding to a “new normal” water future with climate change, and an opportunity to move to more sustainable water use and water policy for California. With a third dry year in a row, the California drought highlights the serious challenges we face in sustainable water use in the western United States as a whole. It is dry by all measures: the amount of precipitation, of snow in the mountains, in reservoirs, in soil moisture, even in groundwater depth. Impacts are already being felt in cutbacks of water deliveries to agricultural users; impacts on ecosystems, particularly fisheries; urban mandatory and voluntary cutbacks; some small systems literally running out of water from their single source. We know we can do the things we want to do with a lot less water, and at the same time save money, ecosystems, energy, and water. As part of our leadership work in responding to the California drought, the Pacific Institute created www.californiadrought.org as a resource, come rain or shine, for the “new normal” water future that requires real action today.